I have two reliable sources of solace: nature, and books. So it's no wonder I finally picked up 1001 Walks You Must Experience Before You Die, edited by Sydney-sider Barry Stone (and of course I immediately flicked through to find which Sydney walks made the grade). The bucket list concept doesn’t motivate me, and this book is certainly no “how to”, but as an inspirational jumping-off point, I loved diving right in. Talk about comprehensive. 1001 Walks covers the world, from a gentle 90 metre stroll over the Ponte Vecchio in Florence, to months-long cross-country expeditions such as the new 23,000km Trans-Canada Trail. Using a team of international contributors, it seems no country is too big, or small, to be included. From the tiny principalities of Liechtenstein and Monaco, to the behemoths of India, China and Russia, it's all here. Think you know about famous trails in the United States and the UK? Well have you considered a hiking trip to Ethiopia, Dominica or Iran? At two kilograms, this book weighs as much as a hiking tent. While it will never accompany you on a walk, 1001 Walks houses all the hiking inspiration you need to get started. You can either read it front-to-back by chapter – overland, urban, mountain, heritage, and coastal and shoreline – or check the index for walks by either country or distance. So how does Sydney stack up compared to the very best walks in the world? 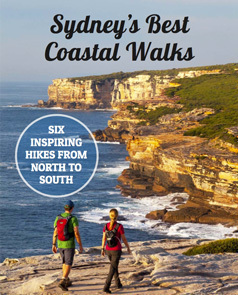 I was delighted to see there are four Sydney walks listed (and relieved that I had done them all!). All up, there are fifty Australian walks included. Milford Track, New Zealand. My first hiking boots were actually Doc Martens, and the uncomfortable external frame on this hand-me-down backpack is a reminder to start with what you have! If the thought of ticking off one of these 1001 Walks makes you look for your passport, you'll also need our tips for packing to hike overseas. Note: this post contains affiliate links, meaning we may receive a small commission if you make a purchase from our recommendation, helping to keep this website up and running. Tagged 1001 Walks, Books to read, Inspiration, Things to do.